The Tactical Operations Command Center (TOC), also known as the IncidentCommand Center (IC) or Emergency Operations Center (EOC) is the one place where coordination, collaboration, and communication must not fail. Managing a large incident, whether it be a manmade or a natural disaster, requires understanding and managing resources for the best possible response and outcome. In the past, At the Ready has published issues with themes related to Mutual Aid (July 2013) and Incident Command (August 2015) with the focus on smaller incidents and building the mobile command for local needs. The Incident Command System (ICS) organizational system for managing disasters is not new. The first, FIRESCOPE, was created in California in response to wildland fires in the 1970s1. As ICS has evolved, through lessons learned, research, and experience, the structure has also evolved. Today, FEMA has NIMS2: National Incident Management System which has resources for the entire community. Yet, while the way we organize, respond, and manage scenes has evolved, many times the tools used to manage resources have not. How does your community manage multiple responding agencies, including mutual aid, and what is the system for tracking personnel on scene? How does your high-level incident command post track operations in given sectors in a large incident scene and mark areas that were searched and are clear of hazards? Large command centers often lack the ability to truly see what is going on in the field and direct the response in the most efficient way. Often there are many people in a room, or Mobile Command Center, each with expertise in a different discipline, managing their own resources while being a part of the greater "whole." In a natural disaster, you can easily have involved in the scene Utilities, Law Enforcement, Emergency Communications, Fire Departments, EMS, Technical and Special Rescue, Community CERT and other trained volunteer responder agencies, and the list goes on. One of the most challenging issues is determining, "who needs to know what" about the response. Does the fire chief need to know where the electric company is removing trees? Probably. Does he/she need to know where the sheriff is blocking roads 20 miles from town to stop traffic flow into the scene area? Probably not. Managing the flow of information to the decision makers who need it can be a real issue in the large IC. Limiting or even eliminating unnecessary traffic can permit agencies to focus on their individual and immediate missions. Another challenge is the perishable nature of information coming into and out to the field. Things happen quickly in this business, and even five minutes can change the landscape and the decisions which need to happen next. What may start as a manageable incident system can quickly become more active as more agencies arrive on scene. How do you get orders to the field, but more importantly, how does the ICC get updates FROM the field as the response progresses? There are solutions out there today, capabilities to assist incident command in the large-scale response. which can assist ICs by sorting and tracking agencies and organizations by discipline, the entire scene by sector, receiving real time video updates from the field, passing relevant information to the field, yet controlling what each discipline "needs to know." The TOC at the Top has a lot of responsibility for ensuring smooth coordination of and efficient use of available resources. Unfortunately, Incident Command effectiveness is always examined in hindsight, by a ton of armchair quarterbacks. Using newer technologies with collaboration capabilities and information sharing in real time can help to smooth the chaos that is inherent in the incident command center. 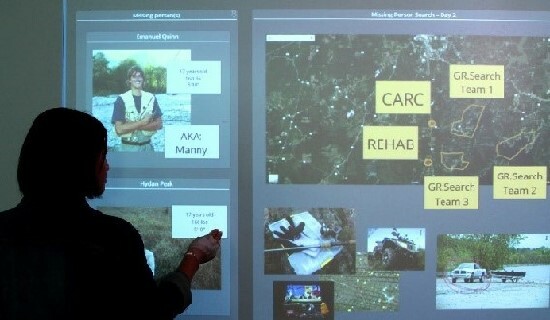 Nureva is one company that offers a solution, called the 'Nureva Span visual collaboration system,' which allows many people to interact with the "canvas" through touchpoints. Their system has the capability to manage access to information, receive real time video, and to send the canvas to the field to devices such as a smartphone. The photos in this article are a representation of a multiagency scene depicted on their system. 2 NIMS is a systematic, proactive approach to guide departments and agencies at all levels of government, nongovernmental organizations (NGO), and the private sector in working together seamlessly and managing incidents involving all threats and hazards—regardless of cause, size, location, or complexity—in order to reduce loss of life, loss of property, and harm to the environment.